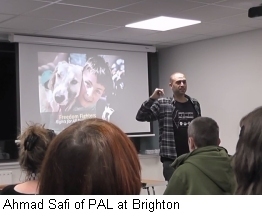 Several Hastings PSC supporters recently went to Brighton to hear Ahmad Safi, the executive director of the Palestinian Animal League, speaking on a national tour. Formed in 2011, the PAL is the only locally-run animal protection organisation operating within the Occupied Palestinian Territories. Those who run the organisation are local Palestinians who realise that the plight of non-human animals is inextricably linked with the position of Palestinian people living under occupation. The PAL adopts an holistic approach. It campaigns against illegal settlers dumping waste and pesticides into water used by Palestinians. It runs educational classes for children in refugee camps to increase understanding of animal welfare. It promotes human strategies for dealing with wild pigs (sic) released by Israeli settlers onto the threatened land of Palestinian farmers - causing destruction of crops and hostility towards the animals. Ahmad explained that there are no animal welfare laws in the Palestinian Territories. While animal campaigners here often spend time discussing the relative merits of animal welfare/rights/justice the situation facing the PAL is far more pragmatic. Stray animals, for example, are routinely killed inhumanely with home made bullets and pesticide - since no medication exists even for humane destruction. One project is working with veterinary students to treat animals - and to fund raise for medication. Another project focuses on promoting a vegan and vegetarian diet. In response to a question about priorities, Ahmad Safi made it clear that oppression affects all in Palestine: animals become the victims of the rage and frustration of the human oppressed. The campaign to free animal and human together must go hand in hand.